2017 has been another huge year for horror movies. Not only have many of this year's genre offerings proved to be hits with critics, but they have also raked in huge dollars at the box office. Annabelle: Creation has been raking it in over the last month and now it is officially taken the title of the highest-grossing horror movie of 2017, overtaking Jordan Peele's massively successful Get Out. According to Box Office Mojo, director David F. Sandberg's Annabelle: Creation has officially grossed $255.4 million at the worldwide box office, with the Labor Day weekend receipts added to its already impressive total. That officially puts it above Get Out, which earned $252.4 million during its box office run earlier this year. There is some room for debate here, as Split earned $276 million this year, but while that movie certainly has some horror elements to it, M. Night Shyamalan's latest movie isn't necessarily outright horror. Regardless, Annabelle: Creation could easily surpass that $276 million figure by the end of its run. There are other factors to consider here. Domestically, Get Out absolutely trounced Annabelle: Creation. Jordan Peele's critically-acclaimed "social thriller" brought in $175.5 million in North America. Annabelle: Creation has only brought in $91 million on the domestic side. Also, when it comes to critical reception, it isn't even close. As for Annabelle: Creation, as far as horror sequels are concerned, it did quite well for itself. 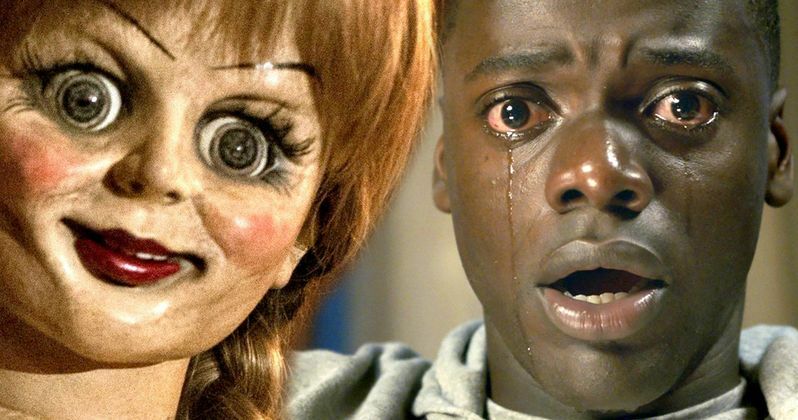 The movie has a 68 percent approval rating on Rotten Tomatoes, which is infinitely better than the first Annabelle, which sits at a dismal 29 percent. That certainly isn't bad, but Get Out is in another league entirely. Get Out remains one of the best-reviewed movies of the year, with a 99 percent approval rating from critics on Rotten Tomatoes. The movie has 282 reviews counted, with just two negative reviews to its name. It is also a serious contender for some awards season love later this year, with some predicting it could earn a Best Picture nomination at the Oscars. Annabelle: Creation isn't likely to get any awards season love, but financially, the results speak for themselves. Annabelle: Creation has proved that The Conjuring cinematic universe has a lot of life in it and could be a massive money maker for Warner Bros. in the years to come. Not only are they moving ahead with The Conjuring 3, but they also have several other spin-offs in development. The Nun, which will be based on the terrifying Valak from The Conjuring 2, is set for release next summer, with a movie based on The Crooked Man in the early stages as well. The Conjuring movies have now grossed $1.15 billion at the global box office, with the help of Annabelle: Creation. The first Annabelle made $256.9 million at the box office in 2014 and is currently ahead of the latest entry, but not for long. Annabelle: Creation will overtake that number in a matter of days and will provide further evidence that Annabelle was a single misstep in an otherwise truly massive, bulletproof, blossoming cinematic universe.